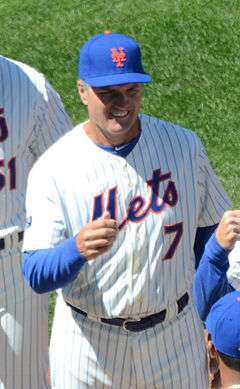 ↑ "Johnston, Former Robin, Signed As Club's First-Base Coach". New York Times. February 17, 1931. p. 37. Retrieved 11 September 2016. 1 2 "Corriden is Hired As Dodgers' Aide - Meanwhile Hartnett, His Boss on Cub Staff, Joins Giants in Player-Coach Role - Minors Will Hear Landis - New Agreement With Majors May Be Judge's Topic at Atlanta on Thursday". New York Times. Associated Press. December 3, 1940. p. 35. Retrieved 11 September 2016. ↑ McGowen, Roscoe. "Dodgers Turn Back Giants on Pass, 7-6 - Camilli Walks With the Bases Filled in Seventh - Durocher, Fitzsimmons Banished". New York Times. p. S1 (section 5). Retrieved 11 September 2016. 1 2 Daley, Arthur (April 16, 1947). "Sports of The Times - Opening Day At Ebbets Field". New York Times. p. 32. Retrieved 11 September 2016. ↑ "Jake Pitler Dies Upstate at 73; Ex-Coach of Brooklyn Dodgers - Gifted Counselor and Scout Began as Minor-League Player and Manager". New York Times. February 4, 1968. p. 81. Retrieved 11 September 2016. ↑ Daley, Arthur (February 7, 1968). "Sports of The Times - Good Humor Man". New York Times. p. 60. Retrieved 11 September 2016. ↑ McGowen, Roscoe (September 21, 1952). "Yanks Blank Athletics, 2-0; Indians Rout Tigers, 11-3; Dodgers Win, Lead by Five As Giants Lose; Yale Triumphs - Erskine Victor, 1-0 - Brooks' Hurler Triumphs With 3-Hitter, Beating Spahn at Boston - Robinson Single Decides - Second Baseman's 4th Blow of Tense Struggle Sends Cox Home in Tenth". New York Times. p. 2S (section 5). Retrieved 11 September 2016. 1 2 Daley, Arthur (March 2, 1958). "Sports of The Times - Under the Sheltering Palms". New York Times. p. 2S (section 5). Retrieved 11 September 2016. ↑ "Dodgers To Offer Job To Durocher - Former Manager Sought as Coach at Los Angeles to Replace Mulleavy". New York Times. United Press International. December 30, 1960. p. 25. Retrieved 11 September 2016. 1 2 3 "M'Ginnity Signed to Coach Robins - Famous "Iron Man" Returns to Majors to Develop Young Brooklyn Pitchers - Otto Miller to Assist - Robbie Also Adds Joe Kelley to Staff - Tigers-Red Sox in Deal - Killefer to Aid Cards". New York Times. December 10, 1925. p. 30. Retrieved 13 September 2016. 1 2 3 Keenan, Jimmy. "Joe Kelley". sabr.org. Society for American Baseball Research. Retrieved 14 September 2016. ↑ "Writers Honor Stengel; Ex-Dodger Manager Feted at Dinner - McCarthy Attends". New York Times. October 9, 1936. p. 35. Retrieved 14 September 2016. ↑ "Lavagetto Named Senators' Coach - Dressen, New Pilot, Hopes to Obtain 3 Oakland Players and Jackie Robinson". New York Times. United Press. October 7, 1954. p. 17. Retrieved 11 September 2016.